Britain bakes, BBQ’s and blisters, this sunshine is not to be wasted. A chance to try and image the sun in hydrogen alpha using the Coronado PST, Canon DSLR connected to the laptop or webcam. The first time I’ve got any really useable results. This solar telescope operates at a very narrow bandpass, sub 1.0 angstrom hydrogen-alpha allowing you to see prominences coming off the edge of the sun and filaments we can see face on along with other surface detail. I particularly like the looping prominence in the top left and you can see the same area with filaments. Those two smaller images were taken with a standard webcam (Philips SPC900) and processed in Registax. 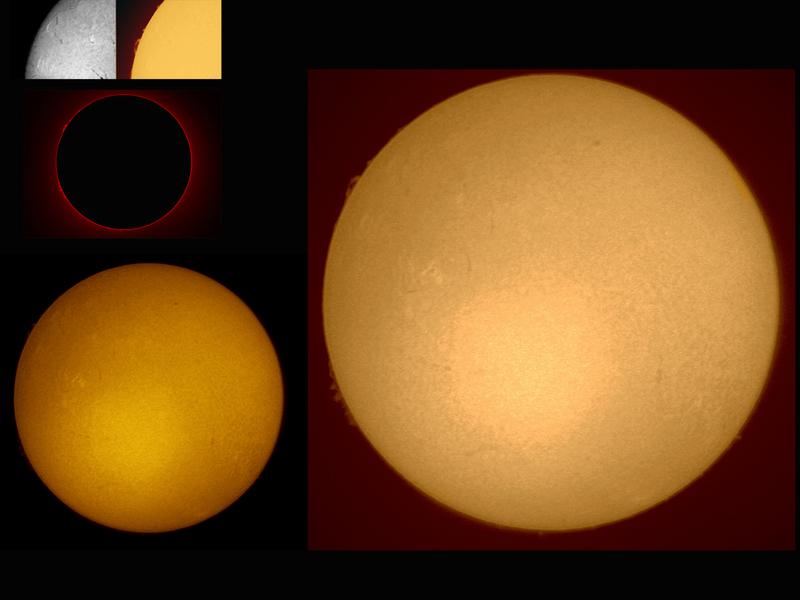 All the other images were taken with a Canon 1000D DSLR connected to a laptop and Coronado PST solar telescope.